Chrome diopside has several origins, but most of the finest material, and the only commercially viable deposit, is in the Republic of Sakha in Siberia, Russia. As you can imagine, production of this Siberian treasure is sporadic due to extreme winters that last more than eight months. 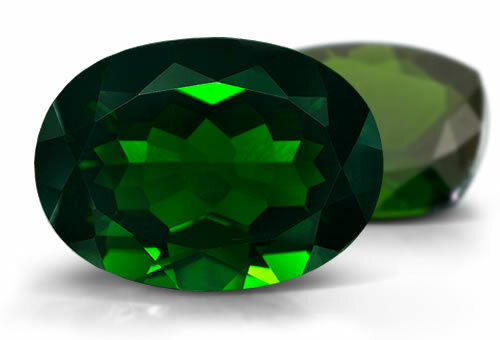 The vivid greens of chrome diopside are a welcome alternative to rare and pricey emerald or tsavorite garnet, but has yet to gain mainstream recognition due to its limited availability. Minor sources of chrome diopside include Australia, Austria, Canada, Finland, Italy, Madagascar, South Africa and the United States. refractive index, birefringence, optic character and spectrum. Chrome diopside may be separated from ordinary green diopside by their respective spectra; ordinary green does not have lines in the orange and red characteristic of the presence of chromium.